Flexible Autos is now offering the Premium Product Package in more than 30 different destinations, including Belgium, Croatia, Cyprus, France, Greece, Iceland, Italy, Portugal, Malta, Mexico, Netherlands, New Zealand, Serbia, South Africa, Spain and United Kingdom! Eliminate the stress of car hire sales with an all-inclusive product! Traditional car rental packages include insurance cover, however in almost all cases an insurance excess will apply. Our Premium Product includes the supplier insurance, zero or reduced excess, zero or reduced security deposit and much more! 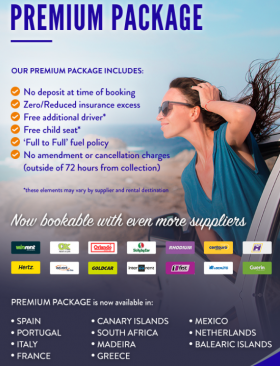 If you want to sell more car hire offer our Premium Product Package and ensure complete peace of mind for your customers. Click see more pictures for large image.